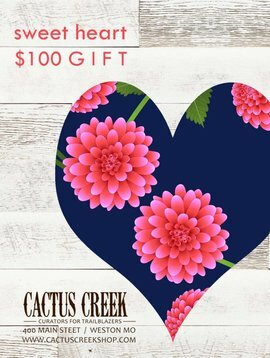 Cactus Creek Gift Cards may be used in the shop or online. May be used on any merchandise in the shop, drinks in The Cellar, or even towards renting event space in The Cellar!!! We can mail it anywhere in the world, or straight to you. Need a custom gift card?? Just call us at 816-878-2278 and we can get one made for you! !